As a Vet. I like to fly my country's flag. As a scooterist, I want to be seen. These two interests go well together, if you can find a way to fly the flag without losing it at 65 mph. And that can be a really big "IF." With a small trunk mounted on the rear carrier it was possible to mount a flag staff on the carrier using this "boat" rail-mount. But then I bought a larger trunk (not seen in this photo,) making it impossible to use the rear carrier for anything else, so it was "back to the drawing board." 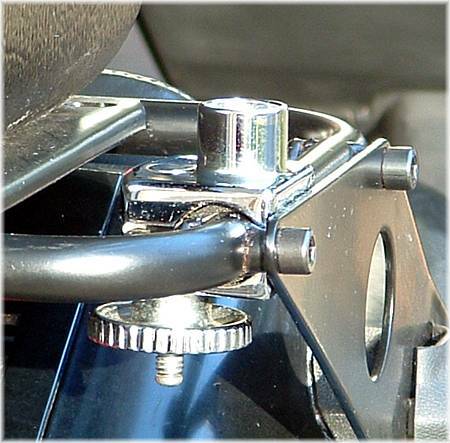 Internet research found several flag mounts for motorcycles, but most of them relied on the license plate mounting as a support. I didn't trust the rather lightweight Helix license mounting to be strong enough for the buffeting and twisting forces a 4' flag staff might exert, and anything shorter would not be visible above the tops of automobiles. 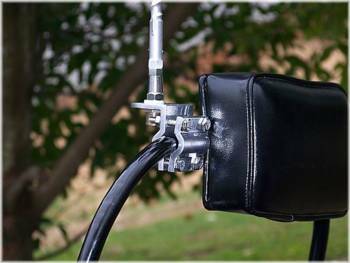 Another issue with those motorcycle mounts was cost; around $75 or more. However, a fiberglass CB antenna appeared to fit the bill just fine. I made a quick trip to a nearby Radio Shack shop and bought this mount (for a mirror or top rack railing) and antenna for a total of about $25. My flag was made to slip over the flag staff, with a sewn-in pocket. To keep it fully spread it is necessary to anchor the bottom of the fly. I use a small plastic wire tie around the flag staff through the bottom of the fly to hold it down. The flag was purchased online from the American Legion (I'm a member) for about $20. It is designed for "automobile" service, but even so, it required reinforcement along the trailing edge seam after a few hours at highway speeds. The flag seen here has been in service for about a year and still looks good. ©2006 Bill Laudeman; all rights reserved. Page updated Tuesday, January 8, 2008 17:27 Eastern time.